In a country like Pakistan, where a woman’s beauty is only judged on the basis of clarity and fairness of her skin; a lot of women are trying hard to become pretty and fair. Whitish complexion has its own attraction but we fail to understand this on a larger scale; because deep inside our hearts we too admire faces with fair complexion. We ladies have made it a serious issue which is why we keep looking around for better and expensive whitening creams. 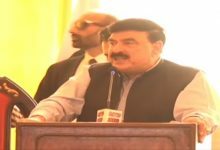 There are numerous local and international brands who have understood this mind set of females and have manufactured skin whitening creams and lotions. They promise to give you desirable results in a short time period. However, not all of them succeed in satisfying their precious customers. We are here to make a little contribution to your search for whitening creams in the market. 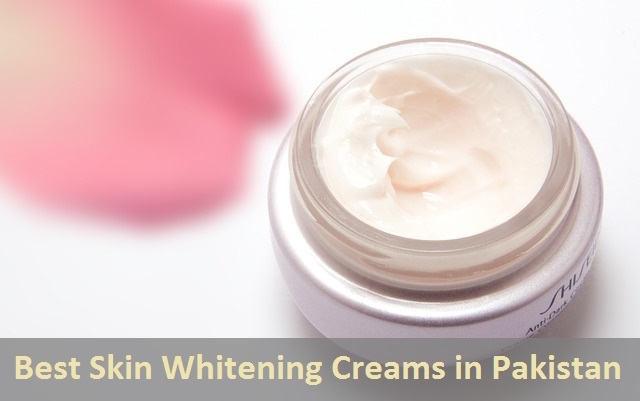 Here is the list of the top rated skin whitening creams in Pakistan. You can find them at various makeup stores and super stores. 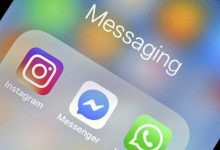 Our ranking is based on thousands of customer reviews, brand reputation and customer faith on the brand. We hope this list is going to be your guide the next time you plan on buying a skin whitening cream. L’Oreal is a well known cosmetic brand. We all have something on our makeup tables with the tag of L’Oreal on it. 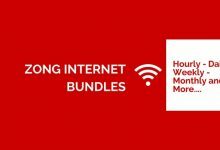 We ladies trust L’Oreal for being a user-friendly and cost effective brand. When it comes to skin whitening creams; L’Oreal has not disappointed its users. It has designed a unique combination of whitening cream, moisturizer, and brilliance conditioned with Royal jelly for its customers. All of these benefits are hard to find in any other whitening cream. 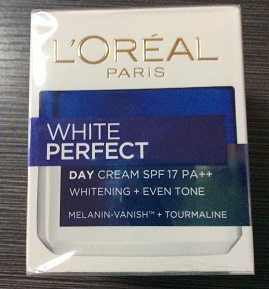 L’Oreal Paris White Perfect Whitening Day Cream SPF17 is dermatologist tested, which means it is perfectly healthy for your skin. This advanced formula of skin whitening cream by L’Oreal has a well-balanced combination of Vitamin E, B3 and C. all of these vitamins are known to control the levels of melanin in the skin that is the basic cause of darker or uneven skin tones. Regular application of L’Oreal Paris White Perfect Whitening Day Cream after cleansing your face will bring out the best possible results for the users and us ladies can flaunt our pretty faces with least makeup. The glass jar may seem to be heavy to carry around but the compact sizes and outstanding results do not make it feel heavier at all. Eveline is a Poland based brand that has made their products available for the customers in more than 70 different countries. 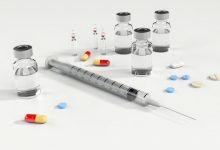 Pakistan is one of them, which means you can find Eveline products at any good drug store or a super store. here we are talking about one of the product from Eveline White Prestige 4D cosmetic series. Eveline White Prestige 4D Whitening Cream is based on an innovative treatment that works in four different dimensions. It works on bringing out the even skin tone. It also counteracts excessive pigmentation for up to 48 hours after application. You can use it on your hands and face to reduce discoloration and promote the regeneration of healthy skin tissue leading to alleviation. You do not have to use excessive quantity of this whitening cream to get the desired results, but a few drops will do their job. Eveline White Prestige 4D Whitening Cream is enriched with natural betaine that optimizes the hydration levels of the skin. It does not leave your face or hands oily at all, rather the cream dissolves into the skin leaving behind silky and soft appearance. It can also be used as a routine moisturizer as it has Shea Butter as a major ingredient. 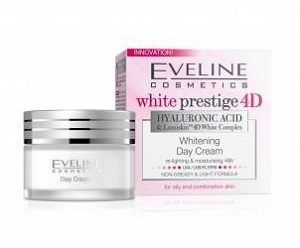 Eveline White Prestige 4D Whitening Cream also works on the roughness of the skin and irritation. It is a moderately priced whitening cream which is easily available in the market. Olay has always been trusted for its hand lotions and moisturizers. 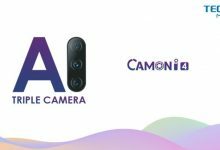 They have been working on making the perfect formula for whitening cream, and the launch of Olay Natural White Day Cream proved that they are still on the line for a trustworthy cosmetic brand. The idea of Olay Natural White Day Cream is to deal with hyper pigmentation keeping the skin moisturized. It nourishes the skin with essential nutrients to give a healthy, fresh and fairer look and feel to your skin. The triple nutrient system of the whitening cream includes Vitamin B3, pro-B5 and Vitamin E that work collectively and reduce dark spots and dullness. It also provides SPF 24 protection that protects your skin from getting damaged due to any external environmental effects; most essentially UV rays. Olay Natural White Day Cream restocks the moisture levels of your skin and prevents dryness. Olay Natural White Day Cream works from within giving you a natural glow. It is a preferable choice for ladies with normal to dry skin. The cream has a soothing fragrance with a fine texture that can be applied easily. Also, it absorbs into the skin instantly, so there is no fear of having a greasy face. 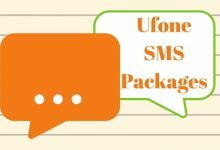 You will get noticeable results within 3 weeks of its use. Lakme aims to follow proper skincare rituals for their customers. To protect the skin from UV damage with the help of sunscreen protection. To make the skin glow by skin polishing actions and dead cell removal. To de-tan the skin with the help of lightening vitamins. The exotic ingredients of the cream work from within the skin to give you the desired results. it also works on the dark spots and dark circles, so you can surely say good bye to the weird big circle around your eyes. It is a must recommend whitening cream for normal to oily skin, however, ladies with dry skin may not find it too much appealing and result oriented. 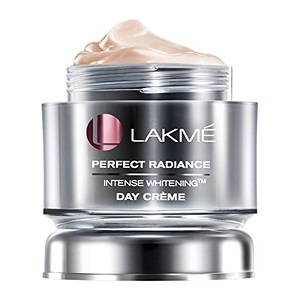 Lakme Perfect Radiance Intense Whitening Day Cream absorbs in the skin even being on the matte side; leaving a smooth texture and pretty lotus fragrance. Those who have used Lakme cosmetics may find the same appealing fragrance in their whitening cream as well. You will not find the need to wear a moisturizer after applying Lakme Perfect Radiance Intense Whitening Day Cream as it hydrates your skin just the way it should be. It is an affordable whitening cream that comes in different sizes for you to carry in your makeup bag or place on your bed side. Here is another whitening cream by Ponds. As mentioned earlier, Ponds has been working a lot on skin products which is why they have a huge product line of skin care items. 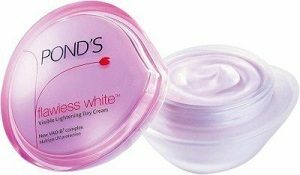 Ponds Flawless White Visible Lightening Daily Cream is enriched with the VAO-B3 complex which is a powerful blend of Vitamin E, Allantoin, and Vitamin B3 complex. It also has multiple UV sunscreens. This cream is not only for skin whitening purposes, but it can also be used as a daily moisturizer. With regular use of Ponds Flawless White Visible Lightening Daily Cream, you can get flawlessly radiant and luminous skin along with great protection from UV rays. Ponds’ products are not overly priced which means you can get great skin results in an affordable price with this skin whitening cream. One thing to mention here is that this cream is not a great companion for ladies with oily skin, and the strong fragrance may be irritating to a few. However, it does work on the light spots on your face. 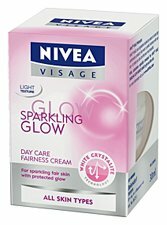 Nivea Visage Sparkling Glow Fairness Cream is a rescue for those women who are a victim of oily skin. 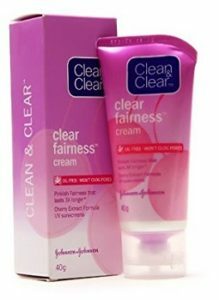 This fairness cream is going to give your skin the rest of all the excess oil that appears on your nose and cheeks if you do not use face wash 4-5 time a day; especially when you are outdoors. Nivea has been friendly with people having oily skin, as most of their products are focused on oily skin treatment. this whitening cream does not only works on bringing out the fairer skin tones but also clarifies the skin from within. It hydrates the skin, which means there is no way your skin will look or feel dry. Also, unlike many other whitening creams Nivea Visage Sparkling Glow Fairness Cream does not clog the skin pores. It lets them breathe so they can get nutrients from the environment. On the other hand, it works on getting rid of the bacteria and cleanses the skin with the large content of glycerin in it. The packaging of the cream is admirable and easy to carry. 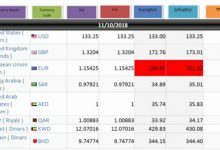 It has given satisfactory results to its users. The skin feels soft, refreshed and supple after application. Fairness creams are not always used to get brighter skin tones, but they are also used by a lot of us to get rid of sun tan. We have seen women with fair complexion picking up whitening creams from the shelves; when inquired they said that they wanted to get rid of dark spots and tan. 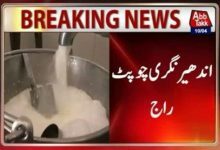 Clean n Clear Fairness Cream is also used for this purpose. This cream does not have too much fragrance, but it does not mean it is not effective. Creams that have strong and long lasting fragrances means they have extra chemicals added into them which can be harmful to the skin. You just need to apply it evenly on your face and neck after cleansing. It is preferable to use it at night because it may give you a white cast on the face which is not a look that you will like. We’ve also shared fairness night creams list, check them out too. However, leaving it overnight solves a lot of issues. It gives proper time for the ingredients of the cream to work on your skin and give you desirable results. It is not an expensive cream and can be found easily on almost every makeup or super store. Over the past years, Ponds has proven itself to be a great friend to our skin. Their product line related to the skin is one of the most used products in the world. Women in Pakistan are a fan of Ponds face washes, bb creams, and lotions. Recently, they have gained popularity over their White Beauty Day Cream with SPF 15. With a large content on glycerin, butyl methoxydibenzoylmethane Ponds White Beauty Day Cream works on the texture of the skin from inside and outside. The SPF 15 content of the cream protects you from the harsh UV rays. If you are a college student or your routine includes getting exposed to direct sunlight, Ponds White Beauty Day Cream is good to go with you. The powder finish of the cream prevents the oil from appearing on your face. Furthermore, the rosy glow will make you prettier and more admirable. ou can use any face wash before applying this skin whitening cream to ensure cleansing. With regular use of 2-3 weeks, you will notice great results. Continuous use of the product can get you the desired skin tone. Garnier gives us the idea to work on our skin when it is well protected from all kinds of external environmental factors. They have given this idea a physical shape with their whitening peeling cream. Garnier Light Overnight Whitening Peeling Cream peels off the dullness from the skin with the help of its intensive exfoliating action. This cream is said to give best results when applied at night. Also, it is better to work on your skin and get rid of dark cells when there is no chance of getting exposed to any more dust and bacteria. It whitens the skin to reduce the dark spots and the nutrients in the cream prevent further skin darkening. You can leave the cream on your face overnight to get the best results in the morning. Moreover, a peaceful sleep of 7-8 hours gives rest to your skin and gets the whitening cream to do the job. The signature lemon fragrance of Garnier leaves the skin fresh and neat. 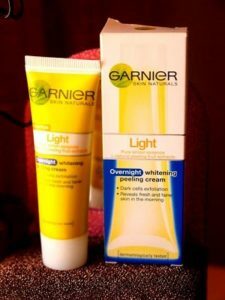 All you have to do is to spread a thin layer of Garnier Light Overnight Whitening Peeling Cream on your face and neck. It may take 15-20 minutes to absorb into the skin, but later you won’t feel the skin to be oily at all. Given the weather of Pakistan, the T-zone of the face gets oily; this can be prevented with regular use of Garnier Light Overnight Whitening Peeling Cream. It is perfect for normal to oily skin. There are many customers who are happy with the refreshing effect after regular use of this whitening cream along with the fairer skin. Daily application of Garnier White Complete Multi Action Fairness Cream gives great results with reference to clarity and fairness of skin tone. They have lemon extracts as one of their basic ingredients. Lemon is known for its bleach contents, which means it adds to the whitening effect of the cream. the fragrance of Garnier White Complete Multi Action Fairness Cream is also lemon flavored, which is one of the reasons why we love it. An active ingredient of this cream is the Active White Molecule which increases the synergistic effect. This cream does not come in the signature yellow tube, but in a small white tube. It has a thick texture but absorbs in the skin within two minutes of application. It contains SPF which means it can also be used as a day cream. some users reported that this cream leaves the skin greasy but we think it depends on the skin type, otherwise it is suitable for all skin types. Revlon has been known for the lipsticks and nail colors, but they have made their place in the list of skin whitening creams as well. 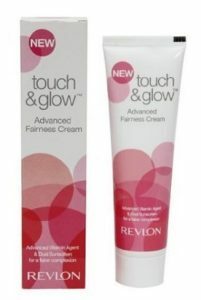 Revlon Touch and Glow Advanced Fairness Cream has honey as their major ingredient which is known for its antioxidant properties and skin repair capabilities. Revlon claims to protect your skin from dual sunscreen damages. This cream has a lotion like texture but it is not at all thick or runny. You can spread it easily on your face and neck without any fear of getting oily appearance. As far as the fragrance is concerned, it does not have a long lasting or strong fragrance so it should not be a problem for irritable noses. It will help you o get rid of daily tan with no chalky layer on skin. It is easily available at any super store or makeup store. You may not need any artificial touching after applying this whitening cream. It can be used to prevent daily tanning, but do not get your hope high on improvement in complexion. Oriflame has a large customer line given their exciting offers and admirable products. 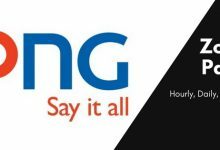 It is one of the rising cosmetic brands in Pakistan. Other than makeup, they have managed to cope up with the skin care products of their competitors. Recent launch of their fairness cream has increased their customer loyalty to a great extent. 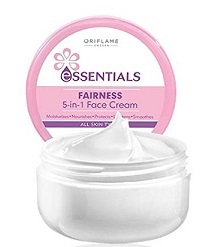 Oriflame Essentials Fairness 5-in-1 Face Cream is designed to hydrate and moisturize the skin along with deep nourishment and protection from harmful external factors. You can find this cream at online shopping websites, Oriflame counters or buy from their agents. One tube of Oriflame Essentials Fairness 5-in-1 Face Cream lasts from around two months, which means you only have to use a little quantity for the application. It has a mousse like texture but it absorbs into the skin and is easy to apply. The finish of the cream is the best thing about it. it gives a balanced finish; not too dry not too oily. It is ideal for use by ladies having oily skin. Weather in Pakistan is quite predictable so you can get your stock on time. you can also use it as a base before makeup application; it will not mess up your eye shades or blush. 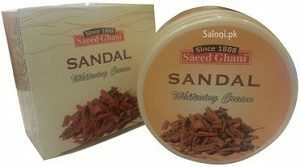 Saeed Ghani is known for their products based on natural ingredients. So is their whitening cream it is based on rich sandal extracts, which can be detected from the strong fragrance in the cream. 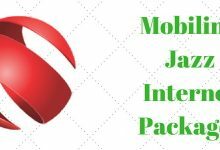 Saeed Ghani herbal products do not come in fancy packaging, so do not expect a glossy packing, but they guarantee their products. All of their products including Sandal Whitening Cream are economical and in range for everyone. 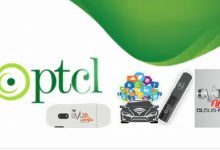 They have their outlets all over Pakistan; you can also find their products at selected retailers. 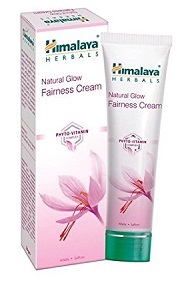 Unlike many other skin whitening creams, Himalaya Herbal Natural Glow Fairness Cream has a high percentage of phyto vitamin complex and a combination of saffron, alfalfa, and other essential vitamins. Alfalfa aims to inhibit melanin synthesis while saffron lightens the skin tone and brightens the dull complexion. With all these essential nutrients, Himalaya Herbal Natural Glow Fairness Cream gives you an even tone and glow from within the skin. It also works on the dark circles and dark spots on the face. You can also use it as a moisturizer. A great news here is that this whitening cream is free from bleach and parabens. It has a typical fairness cream fragrance, but it feels good. It does not have SPF contents, but keeps the skin moisturized without giving any heaviness on the skin. Derma Care skin whitening cream is enriched with powerful whitening agents which is why it has been placed on the list of the best skin whitening creams. It’s powerful whitening agents work efficiently on the brown spots on the skin that may be caused due to acne or excessive exposure to heat and sunlight. It regulates the melanin production which works on the skin darkening. Vitamin C and fruit extracts in the cream slows down the darkening process, ultimately leading to better and even skin tone. The neuro-shield technology provides a 12-hours protection from hyper pigmentation, UV rays and harmful external factors such as pollution. 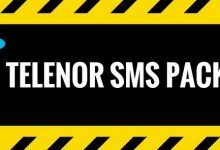 It is available at different super and drug stores. You can give this cream a try if you are looking for something with strong ingredients and quicker results. Reviewed all these creams by my personal experience and the top ones are really magical and these creams are without any harms and you can used them with blind trust. I bought Loreal cream from the above link and it was 100% original, I am seeing really great impact after 2 weeks of use. My friends and family relatives are also asking about this change. Loreal white perfect night cream is effective. 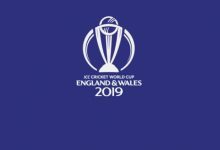 It’s price is from Rs.600-1000. 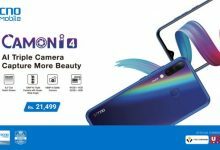 how can i purchase this product from malaysia? Is there a product named Miracle White? 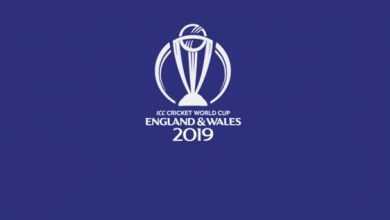 i just bought it and it says from Pakistan. 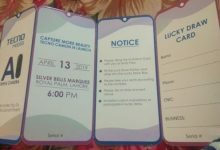 I need to know is this product contain mercury or not.